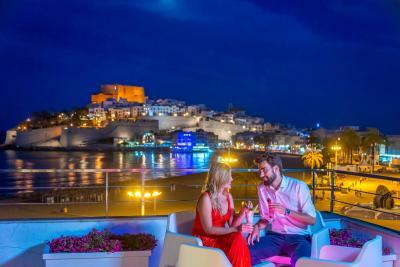 Lock in a great price for Hotel RH Portocristo – rated 9 by recent guests! Friendly reception when we arrived. English speaking and helpful. The room was spacious and overlooking the beach and castle. It was a little chilly at first but after pointing it out to the reception, it was sorted toute suite. A wide selection at breakfast. At first I was surprised to find dinner was provided at a nearby Restaurant as the out of season date made a buffet impracticable. However, the dinner provided was excellent. It was varied, well presented very tasty and a lively place. Good alternative to a buffet. Very friendly and helpful staff, location fantastic! 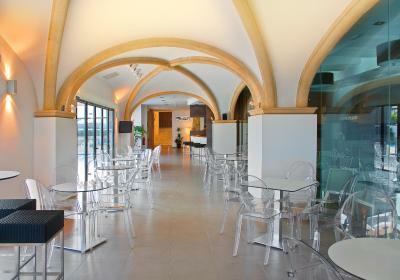 Incredible location,staff we very helpful with everything we needed to know,the hotel itself is very well maintained with fantastic facilities. Breakfast was a true variety and made our stay all the better. 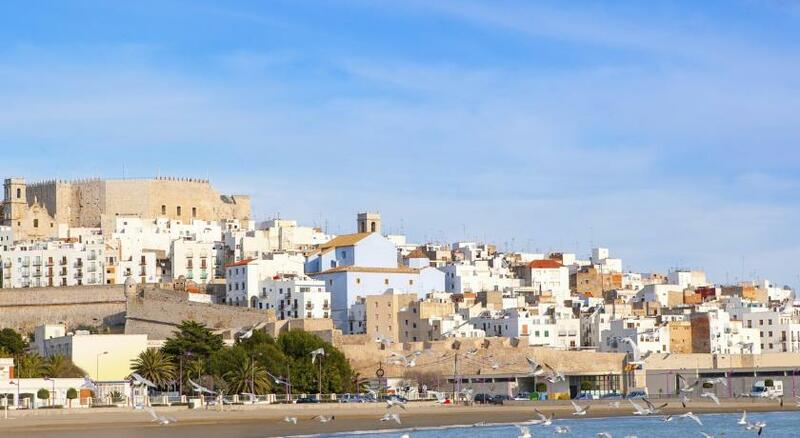 We would not hesitate to book here again upon return to this gem of a town. 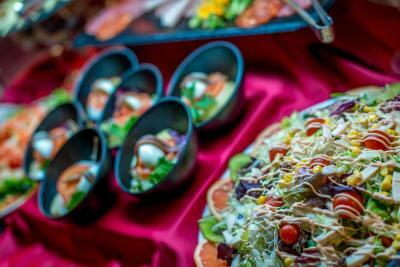 Outstanding buffet breakfast, eggs cooked fresh in front of you. Honest principals.......... website stated 20 Euros per day car park, on arrival reduced to 14 Euros....... on checkout charged 11 Euros. 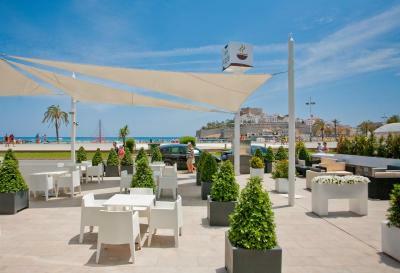 Location close to old town and castle, and the north beach, ideal for senior citizens and families. Food, as usual in RH hotels, very good. Reduced price parking by the hotel, useful. Incredible view, friendly, fast service, pool deck clean and lovely bar. 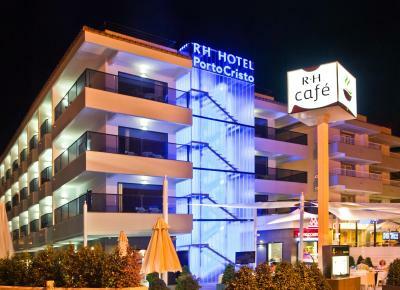 Hotel RH Portocristo This rating is a reflection of how the property compares to the industry standard when it comes to price, facilities and services available. It's based on a self-evaluation by the property. Use this rating to help choose your stay! 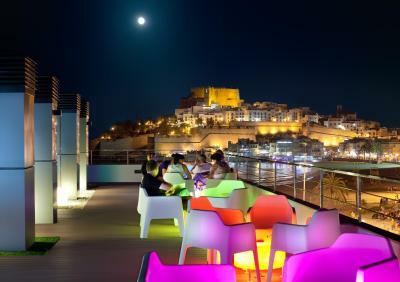 One of our top picks in Peniscola.The Hotel RH Portocristo is a stylish hotel set on Peñiscola beach and overlooking the famous Papa Luna Castle. 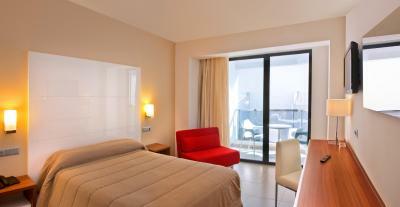 It offers free Wi-Fi and rooms with flat-screen TVs and balconies. 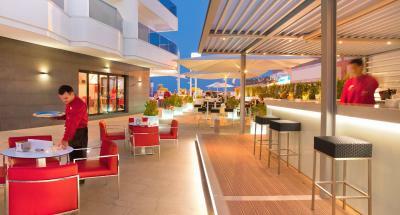 The Hotel RH Portocristo has a small gym and an outdoor swimming pool with a hot tub. 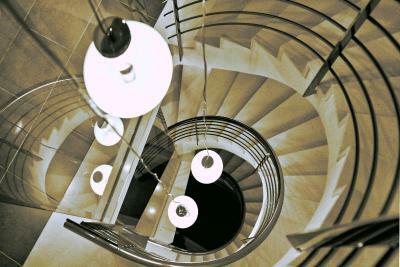 When would you like to stay at Hotel RH Portocristo? 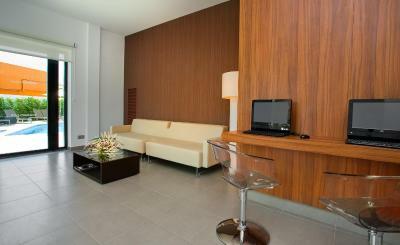 Air-conditioned room with flat-screen satellite TV and mini-bar. The private bathroom comes with a hairdryer. This room does not have views. This air-conditioned room has a flat-screen satellite TV and minibar. The private bathroom includes a hairdryer. 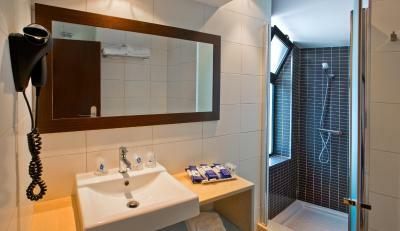 Air-conditioned room with side sea views, flat-screen satellite TV and minibar. The private bathroom comes with a hairdryer. 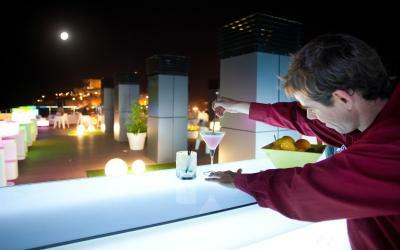 House Rules Hotel RH Portocristo takes special requests – add in the next step! 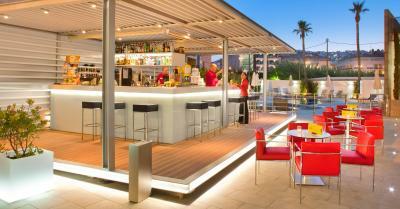 Hotel RH Portocristo accepts these cards and reserves the right to temporarily hold an amount prior to arrival. 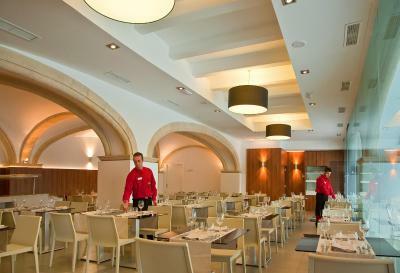 Please note that the restaurant offers a buffet service between 11 April and 31 October. Table service is available during the rest of the year. Please note that drinks are not included in half-board and full-board rates. Please note that during winter the lunch and dinner services will be served at the restaurant Rojo Picota, located 150 feet from the hotel. Please note that the property does not have rooms big enough for 2 adults and 2 children. All children must be included in the indicated room capacity. 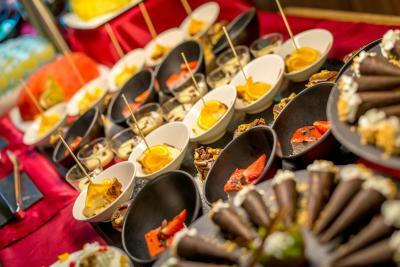 On previous visits both lunchtime the evening meals have consisted of a comprehensive buffet which has always seemed very popular, however, during this visit the meals were waiter served and were more "menu del dia" than "cordon bleu" with a limited selection. The food was well prepared however and the waiter service attentive. Possibly the change was due to it being out of season. Breakfast was of the buffet style, and had plenty of choices. From fresh fruit,yogurts,cereals,bread,eggs,bacon, sausages and cheeses. Plenty of fruit juices,coffee and teas. We visited in winter(February) and the restaurant was closed for evening meals, but there were several alternatives close by. Not tea and coffee facilities in the room, which is quite common in Spain and France. It is a shame because we Brits like our tea!!! Hotel ideally located front line to the beach, a few hundred meters from the citadel. Breakfast was very good although on both days the fried eggs were cold. Evening meals served in resturant 20 meters away, which was excellent. This hotel was in a great location. The staff were very friendly and helpful, I would highly recommend it. Noise issues, was able to hear conversations, amplified as carried via duct ventin.